As eloquently recapped via Young Avengers’ trademark faux-tumblr posts, It’s been a rough three months for our emerging Avengery team of emerging Young adults. 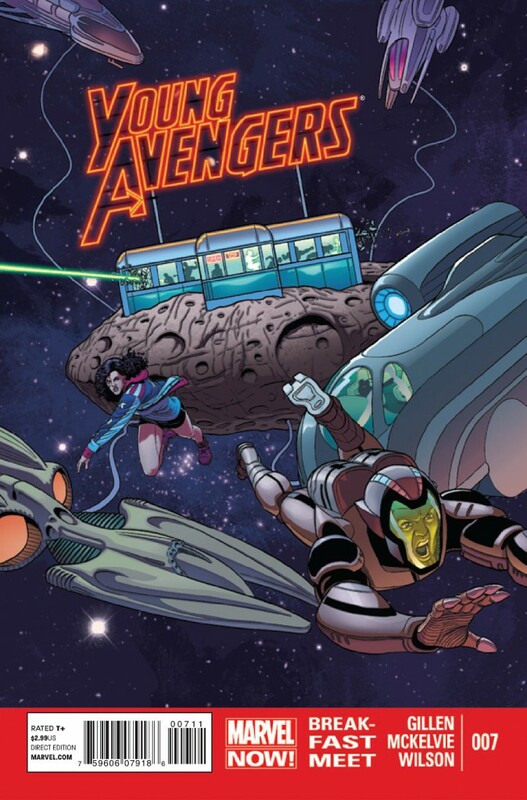 Between birthdays, battles with Space AIMers, fleeing from anthropomorphic cephalopods, and shocking revelations regarding the devious Skifflefuffles, our eponymous Young Avengers have had their hands full since being exiled from NYC due to multiversal alien maternalistic issues. After last issue’s stand-alone story focusing on the office humdrummery plaguing Prodigy and Speed, issue #7 shifts focus back to our heroes and grants them what would appear to be some downtime in between misadventures. Kieron Gillen keeps the characterization going, however, continuing threads regarding Teddy and Billy’s romance and Kate Bishop and Noh-Varr smooching. Oh and Miss America continues her bad@$$ery and Kid Loki his adorable pseudo-villainy. Gillen’s handle of these characters is exquisite, and each issue furthers the reader’s interest in these flawed heroes. The Young Avengers choose to spend their downtime at Kid Loki’s favorite diner (pursuing bacony treats, methinks). As is often the case with these tales, storylines collide, as Gillen takes his stand-alone Prodigy/Speed tale and runs it ramshod into the Young Avengers. Hilarity, as always, ensues. Aside from Gillen’s delightfully post-modern storytelling, it’s Jamie McKelvie’s super fantastic artwork that really makes Young Avengers one of Marvel NOW’s stand-out series. Look no further than a two-page spread featuring panels laid out as cut-out silhouettes of Prodigy’s head recapping his escapades between issue #6 and #7. Brilliant brilliant storytelling and layouts throughout the issue. Oh, and we get some more of Billy’s wonderful side-swept asymmetrical hairdo. Which is a plus.